Global warming is extremely likely to be the result of human activity since the 20th century, according to NASA, and proceeding at a rate that is unprecedented over decades to millennia. The heat-trapping nature of carbon dioxide, combined with a nearly 50 percent increase in global CO2 emissions since 1990, have contributed to a two degree increase in surface temperatures and miles of melted ice in Greenland and Antarctica. Many governments have embraced renewable energies—such as solar power—in response to the growing crisis. By generating electricity from the sun, these governments aim to reduce dependence on coal fired power plants that generate billions of tons of carbon dioxide each year. According to the Union of Concerned Scientists, Coal power plants are the primary cause of global warming with the typical plant generating 3.5 million tons of CO2 per year. Renewable energy targets have been established in over 170 countries at a national, state, or provincial level. For example, the European Union has committed to generating 27 percent of final energy consumption from renewable sources by 2030. United States Executive Order 13693 similarly mandated that 30 percent of all energy used by the federal government come from renewable sources by 2025 through on-site installations and energy offsets. The problem with renewable energies is that they aren’t always as economical as conventional energy. Governments solve this problem by providing subsidies, or funds granted to assist an industry or business so that the price of a commodity or service may remain low or competitive. Subsidies aren’t unique to the solar industry—in fact, the oil and gas industry received nearly $500 billion in subsidies between 1994 and 2009—but they have come under fire. Economists have demonstrated that subsidies increase the quantity of products bought and sold in a market by increasing the demand curve by the subsidy amount. Consumers and producers both benefit from a surplus at the expense of the government. The downside is that subsidies create an economic inefficiency—known as a deadweight loss—because it costs a government more to enact a subsidy than it benefits consumers and producers. The upshot is that subsidies may provide positive externalities, such as CO2 reductions in the case of solar subsidies. Solar subsidies may also help the United States be competitive in a future-focused industry while generating hundreds of thousands of high-tech jobs. However, critics insist that solar subsidies have artificially inflated the value of solar companies and the uncertain nature of subsidies creates volatility for investors. Solar subsidies differ between countries, which has become a source of conflict. After all, a country that offers high subsidies may produce ultra-cheap solar panels compared to countries that offer lower subsidies, creating an unfair trade imbalance. These subsidy conflicts have led to trade wars in the past that have had a significant impact on investment. For example, car tires have been a constant source of trade conflict between the United States and China. Suniva was one of the top solar panel manufacturers in America but eventually declared bankruptcy after its prices were undercut by Chinese solar panels. The company filed a petition with the U.S. International Trade Commission calling for tariffs on these foreign manufacturers to offset the cost of foreign subsidies and make its panels more competitive. These claims could have significant ramifications in the global solar industry. The ITC petition claims that foreign competition has cost the U.S. solar industry 1,200 jobs and a 27 percent drop in wages since 2012. Furthermore, the petition argues that a tariff would create 115,000 to 144,000 jobs by 2022. 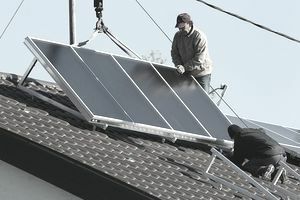 Opponents argue that the tariff could erase two-thirds of expected solar installations over the next five years by making panels more expensive while costing upwards of 88,000 jobs as a direct result. The solar industry is well-positioned to capitalize on favorable policy trends as governments look to offset the effects of carbon dioxide. At the same time, the industry relies heavily on subsidies to remain competitive with conventional energy sources like coal. This means that investors in solar companies may benefit from strong growth rates, but there’s a high risk of changes to subsidies that could generate significant volatility. Investors should be cognizant of these risks when investing in the solar industry. By maintaining a diversified portfolio—both in terms of geography and asset classes—investors can mitigate these risks and increase their risk-adjusted returns over the long-term.